The global industrial fasteners market is extremely crowded. The top 4 players in the industrial fasteners market added up for almost 45% of the global market income in 2016. Stanley Black & Decker Inc., Precision Castparts Corporation, Nitto Seiko Co., Ltd., and Wilhelm Bollhoff GmbH & Co. KG are known as the leading player in the industrial fasteners market. Other prominent players in the market are Acument Global Technologies, Standard Fasteners Ltd., Nifco, Kova Fasteners Pvt. 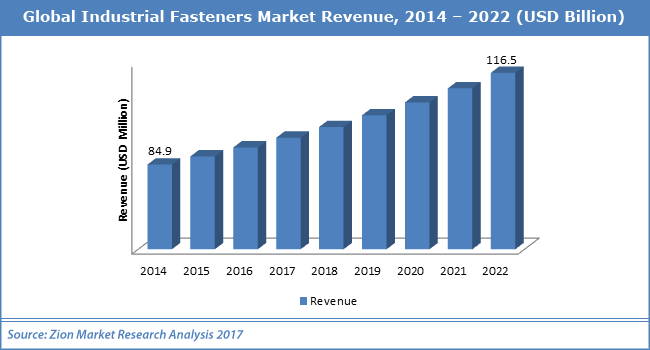 Ltd., ITW, LISI Group, ATF Inc., Alcoa, and MW Industries Inc.
As per analysts at Zion Market Research, global industrial fasteners market was capitalized at USD 84.9 Billion in 2016. The industrial fasteners market is likely to cross USD 116.5 Billion in 2022 and is expected to increase at a CAGR of 5.4 % from 2017 to 2022. Fasteners are employed to join together the different elements of the automobile such as soldering, spot welding, washers, nuts & bolts, clips, clamps, and screws among others. As per analysts at Zion Market Research, the global industrial fasteners market is majorly boosted by rapidly growing demand from the end-use sectors such as aerospace, automotive, and construction. In addition to this, sturdy recovery in automotive and construction sector is sustaining the development of global industrial fasteners market in the developed countries. Apart from this, increasing requirement in aerospace applications for costly titanium fasteners and in automotive sector for light weight plastic fasteners is likely to boost the requirement of global industrial fasteners market in years to come. On the other hand, the possible threat of substitution from optional joining techs such as adhesives is likely to negatively affect the global industrial fasteners market development. However, increasing mergers and acquisitions is claimed to boost the growth of global industrial fasteners market in the near future. For example, in December 2017, Kian Soon Mechanical Components was obtained by BUFAb. Area-wise, Asia Pacific was the biggest area for industrial fasteners market in 2016. It added up for over 30% share of the total income of industrial fasteners market. The development in the area is majorly credited to the development of major end-user sectors such as aerospace, automotive, shipbuilding, defense, and railways. Europe and North America are likely to have decent development in industrial fasteners market in the years to com. In addition, Middle East & Africa and Latin America are likely to see the moderate development for industrial fasteners market due to the increasing demand from automotive & construction sector.